My business is called Where2Walk and we think it has the best walks in the North! In the last few years of my office bound job I had often speculated as to how I could combine my career in marketing, knowledge of tourism with a love of the great outdoors and walking in particular. In my spare time I set up a basic website where I could write about my favourite walks; it became addictive and I ended up doing more and more walks, discovering little gems and enjoying not only the walking itself but writing them up and planning more of them. The website proved to be popular as an information site for those visiting the area, hopefully as much for its personality as the walks themselves. 5 years ago the hobby became a job (out of necessity!) and I started to add a Guiding service, Navigation Courses and the booking of Walking Holidays to what till then was just an information site. It is now full time. I love planning new walks and discovering new walks. Nothing is better than looking at a map (paper map) and deciding where to go for the day. The day itself may prove better or worse than expected but that is all part of the fun. It is a walking site based on a personality. 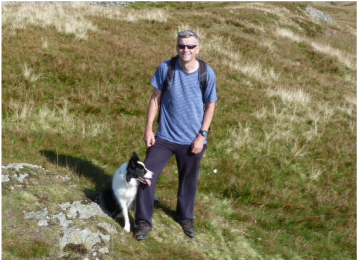 Many walking sites are coldly corporate and unimaginative, I like to think Where2Walk with its regular blogs from myself and of course my border collie Mist create an interest and pleasure that others do not. To be honest pretty much anywhere - taking a walk and being out in the fresh air without fail improves the spirit - its a medical fact! Stay in Littondale at either the Falcon at Arncliffe or the Queens Arms. A walk to the north takes you over to Langstrothdale and south to Malham Tarn. Peaceful walking in a delectable valley through classical Dales limestone scenery. Is there anywhere in the Yorkshire Dales where you feel sudden swooping joy? I live in Long Preston and there is a long swathe of perfect green path that descends from Langber Lane as it drops to Long Preston Beck. Perfect and only us locals know! Looking north from near Buttertubs towards Keld, Muker and Kisdon Hill with the wild Pennine moors beyond. Robert Palmer used to run the Maypole Inn at Long Preston and was a character that meant the pub was worth going to. The pub itself is tired but Robert made it cosy and typically Dales. Now since he left it's sadly changed. A personality can make or break any business. 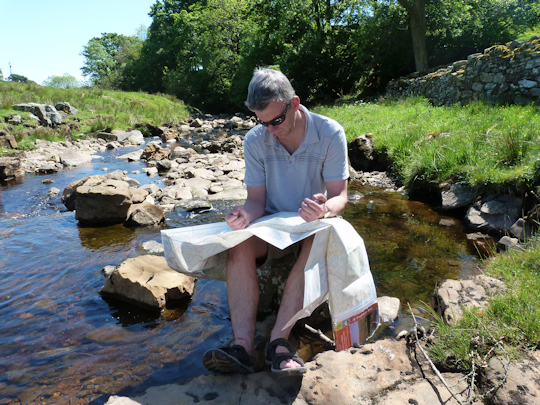 I have a real love of Paper Ordnance Survey maps. There is so much to these wonders, even on cold dark winter evenings they bring the Dales to life. I despair when I see people walking with a guide book in hand and concentrating on counting their 300 metres before turning left and then right - use a map and discover a wider world.